Not to be confused with Yasuhiro "Yas" Takagi. 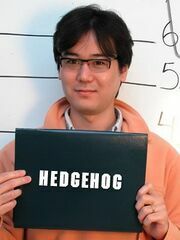 Hirokazu Yasuhara (安原 広和) was game and level designer for Sega. He remained the chief map designer for the early Sonic the Hedgehog games all the way through Sonic R in 1997, and the shelved Sonic X-treme. He continued to give his design expertise to Sega of America projects, such as the 2001 Floigan Bros.. Between Sonic R and Flogain Bros. he got money from Sega of Japan to be involved in Disney rides and attractions. In 2002, Yasuhara left Sega and joined fellow former members of the Sega Technical Institute at Naughty Dog, where he worked on the Jak & Daxter series as well as the first installment of Uncharted. In 2008, Yasuhara departed Naughty Dog to take up a job at Namco Bandai America, where he worked on Pac-Man Party, which released in 2010. In 2012, Yasuhara was hired by Nintendo Software Technology Corporation, a US-based division of the company of the same name best known for developing the Mario vs. Donkey Kong games. He has worked with the Education team of Unity Technology Japan to create game-design educational materials since 2016.